Do you feel your teeth are discoloured? Has your smile been stained by tetracycline? Would you like to gain a more youthful appearance? The teeth whitening procedures offered at Just White Dental can rejuvenate your look and leave you with a dazzling, bright smile. 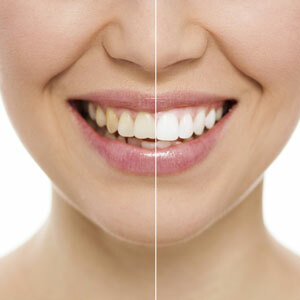 Whitening your teeth is an easy, noninvasive solution to refreshing your smile. We offer you in-chair and at-home whitening procedures. Both are highly effective though the procedure for each differs. You may need a preventative checkup and clean before having your teeth whitened. If any decay is present, we can remove it and treat the affected tooth ensuring that you receive the maximum results from your whitening procedure. In just an hour or two, you can leave our practice with a transformed smile. We recommend that you have your whitening done in-chair if you have a busy schedule and prefer to have the procedure completed efficiently. You can complement this procedure with a few nights of take-home whitening applications to maximise your results. You can get the same dazzling smile by completing your whitening procedure in the comfort of your home. The treatment then takes place over 2-3 weeks. You’ll receive a custom-created whitening kit that’s different from the over-the-counter versions you find in the pharmacy. It’s made just for you with a comfortable fit and is simple to use. After about a week, we’ll have you come into the practice for a check to review the colour improvement and make any needed adjustments to the whitening process. You’ll be taken care of from start to finish. Contact us today to discuss which teeth whitening West Ryde option is right for you! We accept health fund coverage and provide flexible payment plans that make it simple to get the dental solutions you need to reach your goals.